Congratulations to Emily C, Handmade in Israel, and BlackAsphodel! You see, the vases are actually container covers, not true vases. Use an ordinary glass jar to hold a flower arrangement, plant, candies or whatever you like, then place the pleated paper cylinder around it. Water bottles, jam jars and small tea light holders easily accommodate the three sizes. Another neat thing is their DIY aspect. Sturdy metallic paper sheets (120 g/m2) in nine colors arrive in flat mailers with folding instructions. Just crease along laser-marked fold lines. Each cover has a closure to hold the cylindrical shape. They are easy to pack away away flat on a shelf and use again in the future. Such a pretty way to freshen your decor at a moment's notice! The shimmering pastel shades are perfect for spring - pink, green, blue, lilac, and white. More dramatic colors are available as well - black, grey, deep red, and copper. Scroll through all of the 27 models here. To place an order, there are two online shops, each with an English version: Ladrome and Miniaturedesign.dk. Questions? You can reach Helle directly via the Stjernestunder website or Facebook page. Now about the giveaway: first off, it is worldwide! 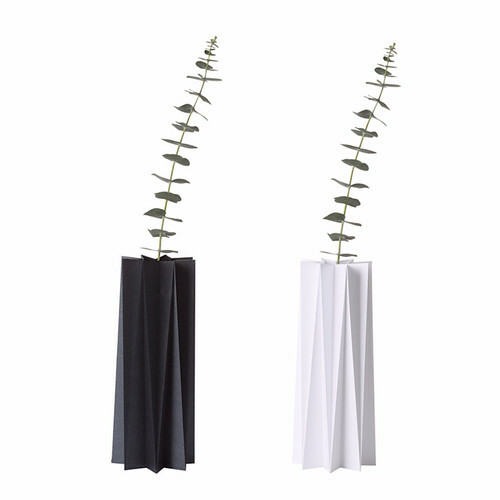 Helle will personally send five Pleat Vases to three winners (two small, two medium, and one tall) in your choice of color(s). To enter, leave a comment on this post through Sunday, April 26. Be sure to include a way to be contacted within your comment. Earn a bonus entry by following @allthingspaper on Instagram and liking this giveaway photo. Good luck! What a great idea making them resizeable! 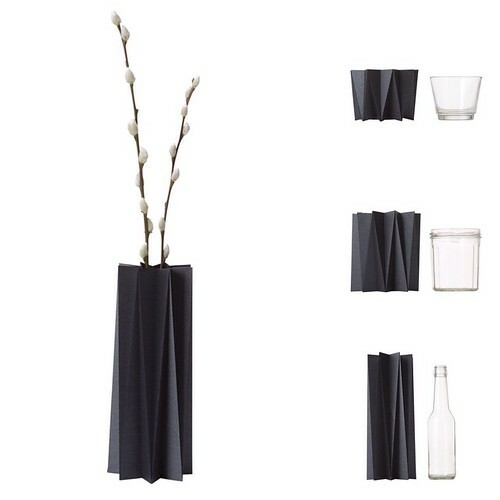 Hi Ingrid, to clarify, the vase covers are reusable, not resizeable. They do come in three sizes though. These are wonderful and clever! I also "liked" this on Instagram! I love the creativity of these and the sleek look is so modern! 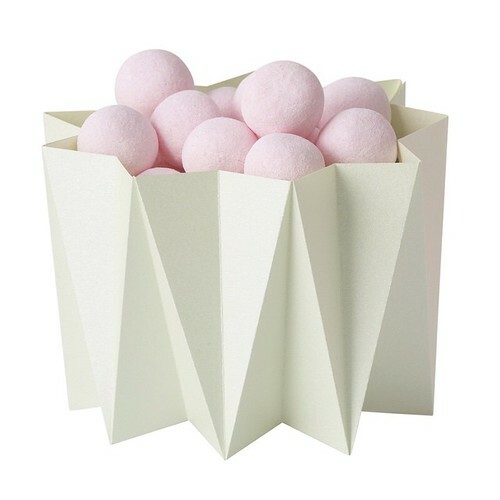 The paper-vase are beautiful. Ann, I love your input on this site. I read your blog regular. Thank you for the tips. Helle Holst Stjernestunder-site and all I can say is WAUW!!!! Woud love to have a go at receiving such a nice giveaway. These would look really nice in my home. I love contemporary styles. So cute yet elegant. I look forward to making a few. Thanks for the chance to win the giveaway. So beautiful and perfect for all décor! thanks for the chance to win them. I follow you and Stjernestunder on instagram and i'm very fascinated from your profile. I write from Italy and i have a blog and a web-site dedicated to the origami world. I'd like to share my passion with you and to win this competition to write about it as winner. Very nice site and blog, Gabriella. I love paper jewelry too. Thank you very much Ann! Pick me! Pick me! They are beautiful! I love the black ones! I did the IG entries as blackasphodel. These are so stunning and would like nice in my dining room. I love these they are so modern yet, classic. That's unique vases. Good luck to me. Thanks for the giveaway. Very unique idea and really like them. Would love to win. Fun items, I,d love to call my own. Thanks for the opportunity. These are stunning! They would fit right in with our clean, modern decor sensibilities. These are amazing and I would love to win! I would love these for my friends wedding. How perfect. These are so gorgeous; I love how classy and unique they are! I love these!! They are super cute and chic! A fun way to decorate plain vases and decorate for important events!! I love these!! So cool! These are so beautiful . I love the simple elegance and how they would add style to any room they were in. Oh, how lovely! I would really like to win this! Outstanding vases! They are so unique! Beautiful! So sculptural. I love these. I have exactly 5 vases that I keep in use! One has fake flowers and marbles and the other four are two bouquets split into those four vases. I have never thought about this , but I think it will be very pretty. So pretty and such lovely colours!! 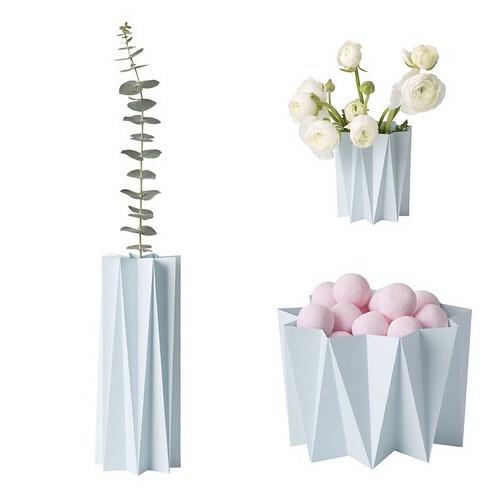 Beautyful vases! I'd like them with Disney characters. Would it be possible? Love these!! Getting married in August and these would be perfect! Thanks for the opportunity. These are so lovely and unique. These are so unique and trendy! I love it! Fits the style in my house! The giveaway has ended. Thanks for all the enthusiasm and entries!